WD1003FZEX, high performance, high power consumption. 1 TB, 3.5 Inch, 64 MB Cache, 7200 RPM, SATA-3 6 Gb/s. Also comes in 2 , 3 and 4 TB sizes. 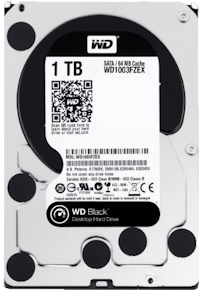 This drive is almost identical to the older WD1002FAEX model, but it much cheaper. Specs.